This is an ideal choice for touring riders or commuters who ride on and off road and who's priority requirement is puncture protection. 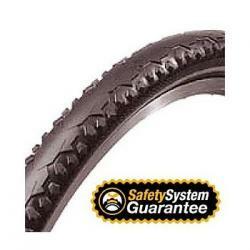 It has a Kevlar reinforced anti-puncture belt under the tread along with Duraskin sidewall protection. It also has a semi slick tread, with knobbly "endless edge" shoulders, great on road and not bad off road.